The Juniper Networks® SRX4100 and SRX4200 Services Gateways are high-performance, next-generation firewalls and hardware-accelerated security services gateways that protect mission-critical data center networks, enterprise campuses, and regional headquarters. The SRX4100 and SRX4200 not only provide best-in-class security and advanced threat mitigation capabilities, they also integrate carrier-class routing in the same platform. The SRX4100 and SRX4200 deliver a next-generation security solution that supports the changing needs of cloud-enabled enterprise networks. Whether rolling out new services in an enterprise data center or campus, connecting to the cloud, complying with industry standards, or achieving operational efficiency, the SRX4100 and SRX4200 help organizations realize their business objectives while providing scalability, ease of management, secure connectivity, and advanced threat mitigation capabilities. The SRX4100 and SRX4200 protect key corporate assets as next-generation firewalls, act as enforcement points for cloud-based security solutions, and provide application visibility and control to improve the user and application experience. The SRX4100 and SRX4200 hardware and software architecture provides cost-effective security performance in a small 1 U form factor. Purpose-built to protect up to 40 Gbps Internet Mix (IMIX) firewall throughput network environments, the SRX4100 and SRX4200 incorporate multiple security services and networking functions on top of the industry-leading Juniper Networks Junos® operating system. 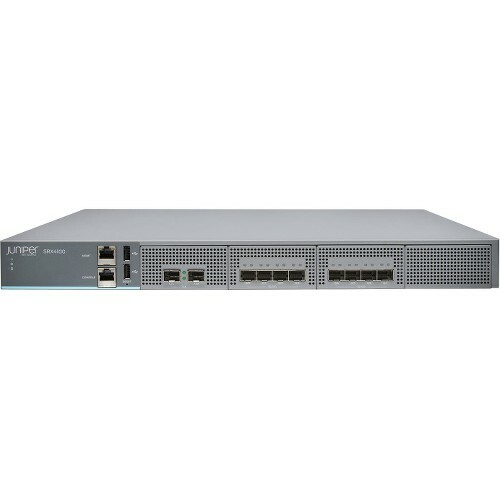 The SRX4100 supports up to 20 Gbps (IMIX) of firewall performance, 7 Gbps of next-generation firewall (application security, intrusion prevention, enhanced URL filtering, and logging), and 5 Gbps of IPsec VPN in data center, enterprise campus, and regional headquarter deployments with IMIX traffic patterns. The SRX4200 supports up to 40 Gbps of firewall performance, 15 Gbps of next-generation firewall, and up to 9.6 Gbps of IPsec VPN in data center, enterprise campus, and regional headquarter deployments with IMIX traffic patterns.